A cereal, used a lot in rural India, it has a high fiber content. The most common millet is pearl millet i.e bajra, which is an important crop in India. India is the largest producer of pearl millet. Very famous in Rajasthan, it is the most famous type of millet. Bajre ki roti with sarsoon da saag is one of India’s signature dishes from the farms. These brown grains incorporate a nutty and bittersweet after taste. It is commonly prepared as a bread and stuffed parathas whereas the flour can be used to make dokhlas, Munn and chaklis. Bajra should always be consumed fresh therefore it is best to purchase it in small quantities. Bajra is called babala and lebelebele in Africa and milheto in Brazil. One cup of dry pearl millet expands to three cups of cooked millet. Over 90 percent of pearl millet cultivated is consumed as food by humans. Having its texture similar to brown rice, it can be cooked like rice. It is also used in the preparation of flat breads. Pearl millet is grounded to flour and is used in making various baking products like breads, cookies, muffins, chapatis/ flat bread and biscuits. It lasts for not more than 15 days. The dried bajra grains are ground to flour which is light brown to greyish in color with a nutty taste. Bajra flour is usually used in winters as it is known to warm the body. Hi friends! A new recipe for the winter. Once you make this yummy halwa in winter, it will remain on your dessert’s menu for every winter!!! In a pan take 2 cups of water add Jaggery to it. On a high flame bring it to boil, reduce to low flame till jaggery has melted in water completely. Heat ghee in a wok/kadahi add millet flour to it. Stir frying cook on low-medium flame until it changes colour and slightly golden brown in color. Add the hot jaggery syrup. Mix well and cook on medium flame stirring continuously until it gets thick in consistency. When halwa gets thick add ground nuts and cardamom powder. Mix all ingredients really well and cook for one more minute. 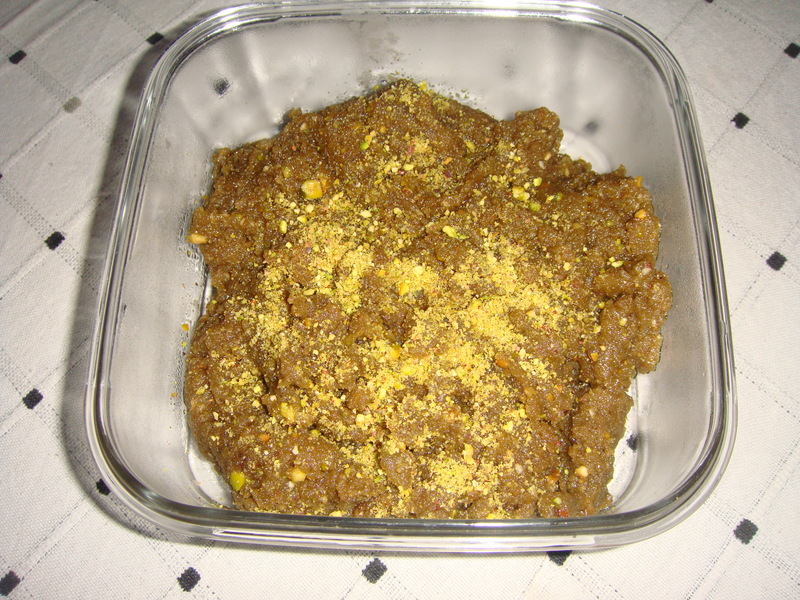 Millet flour halwa is ready. Garnish the halwa with a tabsp of ground nuts and serve hot. You can increase or decrease the quantity of sweetness in halwa as per your choice. Bajra is high in proteins, iron, calcium, folic acid and prevents anemia. It is higher in calorie count than wheat. It also promotes a healthy nervous system. Many claim bajra is the key to a slim waist since it aids in burning fat. It helps to overcome acidity due to its alkaline nature. The Hunzas – who live in a remote area of the Himalayan foothills and are known for their excellent health and longevity – enjoy millet as a staple in their diet. Millet is asmart carbwith lots of fiber and low simple sugars. Because of this it has a relatively low glycemic index and has been shown to produce lower blood sugar levels than wheat or rice. Millet consumption decreases triglycerides and C-reactive protein. All millet varieties show high antioxidant activity. Millet’s high protein content (15 percent) makes is a substantial addition to a vegetariandiet.